Russia had always seemed a bit mysterious, a bit unknown to me. So when my friend Inga said she would come travelling with me in April 2012, to Moscow, St. Petersburg, Tallinn and Riga, I felt excited but nervous at the same time. The first week of the trip couldn’t have been more contrasting compared to the second week. In this post I will tell you about our experiences in Moscow and St. Petersburg, the adventures and the mishaps. The ordeal of getting a visa to go to Russia sets the scene for your time there. We turned up early, thinking we’d beat the crowds but the in-the-know Russians (we were the only non-Russians there) were obviously much more experienced than us rookie first time travellers to a communist country, and were already waiting despite the consulate not being open. So we stood in what can only be described as a cage outside the Russian consulate in Hamburg and waited our turn. We had to buzz in and say why we were there and wait for the security guard to yell at us in Russian when it was our turn. After filling in a plethora of paper work, telling them every detail of our lives right down to what we ate for breakfast when we were 5, they granted us visas. If you want to visit Russia you have to be very specific about the dates of your visit because the visa is only for those dates, not your standard 30 days. We went there with the knowledge that few people spoke English and this was no exaggeration. Having a friend to share in the experience made it more comical than frustrating. There was the time we were standing on the street corner looking at the map trying to figure out where on earth we were. This is a challenge in itself when the street names are in Cyrillic and the map used the English alphabet. A guy so generously asked us if we needed help. Of course we accepted his offer with fervent glee. Unfortunately he could speak about 10 words of English and was very little help to us but the gesture was incredibly sweet. We started our journey in Moscow and then caught the overnight train to St Petersburg. Buying the train ticket was a challenging task. We stood patiently in a long line, thinking back to the visa application process. However, we were hopeful because the girl serving was young. Once we reached the ticket window the first thing we asked was if she spoke English, in our very bad Russian, and to our disappointment she said no. Thank goodness for Google Translate and miming is all I can say. We managed to obtain two tickets, we weren’t sure if we were going to end up in Siberia and couldn’t read any of the information on the ticket. On the evening of our departure we hoped that we had the tickets for the right day. We headed to the main train station in Moscow. Once we came out of the metro we realised that we were about to face the next challenge of finding the correct platform. There are loads of different areas where you can catch the train which is very confusing. When I went to talk to a lady at a ticket window and asked her if she spoke English she proceeded to talk to me in Russian. We wandered around for ages trying to decipher something that looked like our train number and St Petersburg. Eventually I went up to some sort of guard looking person and asked for assistance. To my relief he replied, “Sprechen Sie Deutsch?”. I have never been so relieved to speak German in my life (I must admit that I do not have a love for the German language which definitely has contributed to my lack of fluency in the language). I quickly called over my friend Inga, who is fluent, and the nice albeit rather gruff man walked us around the back of a building to our hidden platform. I’m not sure we would have found it even if we did speak Russian. A train eventually pulled into the station. We were still a little apprehensive if it actually was the right train. To our delight we had a lovely Russian couple in our cabin who spoke English and confirmed that we were on our way to St. Petersburg! Russia is not completely set up for tourism so be aware that there will be language issues but make the most of the situation. Restaurants were another place we didn’t even consider encountering problems until we were there. The majority of restaurants do not have English menus so you can live on the edge and take a lucky dip, some do have pictures to help, or you can hunt around for the few restaurants that are catering to tourists. We managed to find a few tourist friendly restaurants after a little bit of exploring and asked for recommendations at the places we stayed. It is definitely possible to find some good places to eat. We went back to King Pong a few times when we were in St Petersburg. You can also get some really good hot chocolate at various cafes, made from real chocolate! I can also recommend the blini pancakes that you can get everywhere. In order to make your life at least a little easier in Russia I can highly recommend you learn at least a few Russian words. 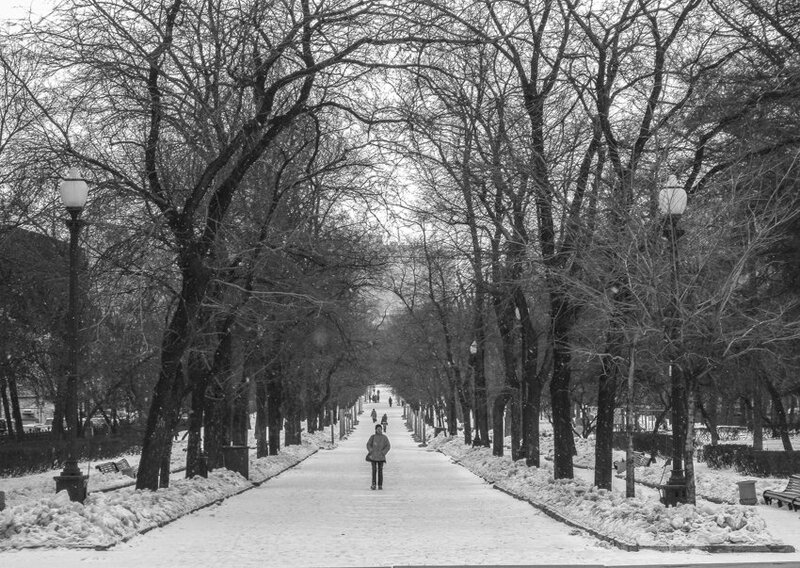 Once you start learning the Cyrillic alphabet and saying the words out loud you will find some words actually start sounding like English words which makes it easier to navigate around the cities and read signs. 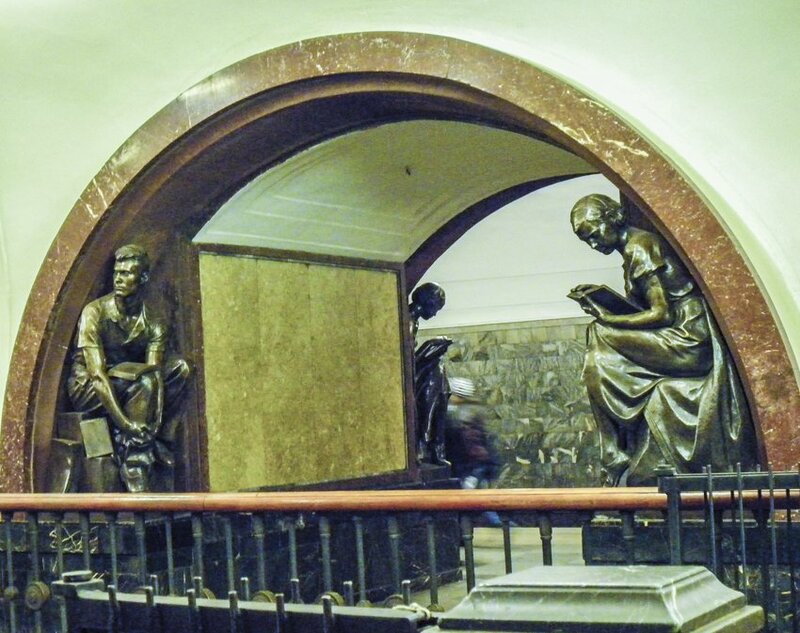 In Moscow the metro stations are works of art. A history museum more than a train network. The metro system is a testament to the values of Stalinism. The stations are deep under ground and are made of marble, with stained glass mosaics, bronze statues (some of which people nonchalantly rub as they walk by for good luck) and chandeliers everywhere. We actually made our own tour of the metro system thanks to a little tourist brochure we picked up along the way. It was quite comical because we would get out of the train, click, click, click with our cameras and then hop on the train to the next station. Luckily the Moscow metro is very efficient, even if the trains themselves are a little old, and the trains come about every 2 minutes (every 30 – 60 seconds during peak hour). We did get some very strange looks from the locals. Oh a quick tip, do not attempt to do this during rush hour, all of Moscow seem to catch the train at once! The architecture in Moscow and St. Petersburg is beautiful. Despite the glum April weather both cities still looked stunning. St. Basil’s Cathedral in Red Square, Moscow, brings so much life to the square with its onion domes and vibrant colours. I’m not an overly religious person but throughout the world architects of bygone eras really knew how to make beautiful buildings of worship back in the day. 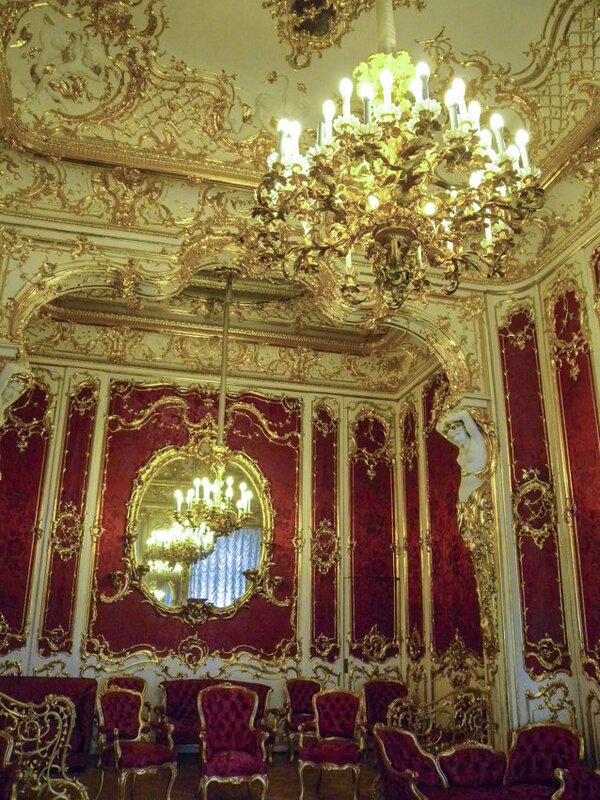 In St. Petersburg the Winter Palace is a must see. The opulence of every room is mind-blowing. As soon as we arrived in St. Petersburg we partook in a free walking tour (St. Petersburg seemed a little more tourist friendly). 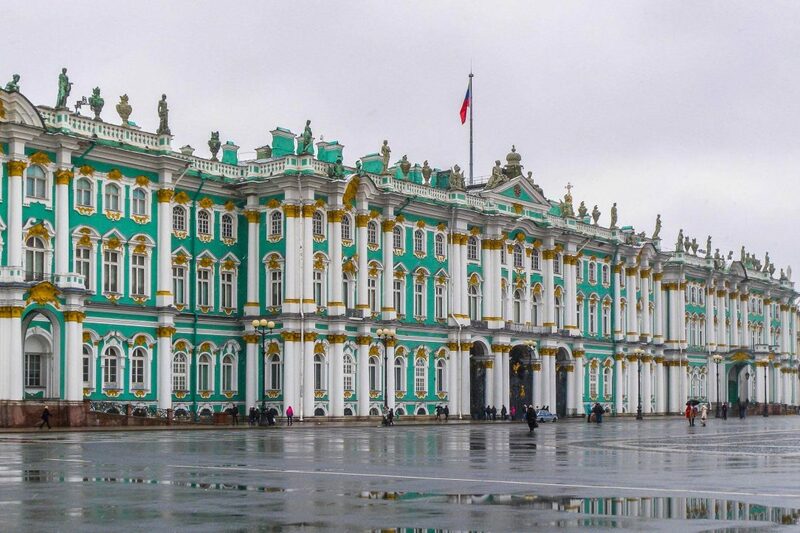 Apart from learning a tremendous amount of history we discovered amazing hidden courtyards that couldn’t differ more from the extravagant palaces around St. Petersburg. 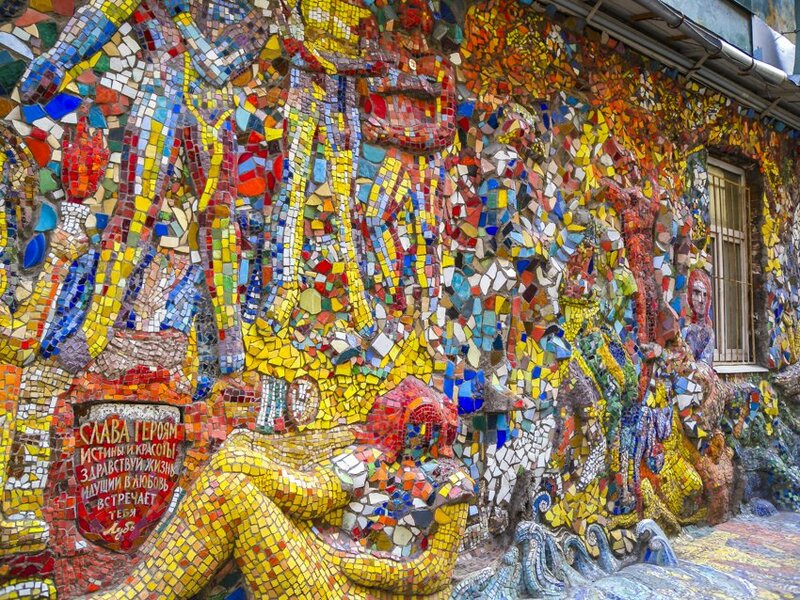 We discovered courtyards filled with colourful mosaic sculptures that seemed to almost to give the finger to the oppressive leaders of the past. At first attempt we found it difficult to find decent cheap accommodation. We eventually found rooms in both Moscow and St. Petersburg in converted apartments. In Moscow it was actually someone’s apartment that seemed to be left over from the 1970s where the family literally rented out a room in their apartment. In St. Petersburg it was a little more modern, a whole floor of an apartment building converted with large rooms and a shared bathroom. Moscow and St. Petersburg are fascinating cities to visit. Even though we visited most of the standard tourist destinations, it is not overrun with tourists. Russia’s history is one of turmoil and tragedy but interesting nonetheless. The people seem to fulfil the stereotype of being abrupt and unfriendly at first, however once you get talking to them they are really very welcoming and happy to have you in their country. However, despite this, if you don’t follow the rules, like absentmindedly stepping off the footpath at the Kremlin, you will very quickly be told to behave. Go there with an open mind and a thirst for knowledge. Oh and one last thing, go and see a ballet! Did you enjoy this post? Have you been to Russia? Let us know what you think in the comments section below. 4 Comments on “From Russia with Love”. Join the Conversation Here! Fab post travel buddy! We really did meet some lovely people. I remember us miming “kangaroo” complete with ears, paws and jumping around on the street. “We are from Australia NOT Austria”……… And going to the ballet in St Petersburg……fun times!! Thanks Marta. Russia is a fascinating country, I look forward to visiting again one day soon. Visiting a country where English is not widely spoken just adds to the challenge and often makes it more amusing. It also means that you are likely to have more unique experiences. Thanks for following us. ?